Nicole Jeffrey explains the various factors influencing how polar sea ice behaves. Teens explored how heat and salinity affect ice and its behaviors. Nicole Jeffery studies climate and sea ice modeling at Los Alamos National Laboratory. She opened her presentation by introducing the idea that there is life in sea ice and followed with several thought provoking questions to to stimulate discussion. Teens explored: What types of life might be present and why? How does it change throughout the year? What factors affect ice growth, melt, and movement? and more. This set the stage for an interactive event. The teens were very engaged throughout the discussion and learned a lot about microscopic processes occurring over millions of square kilometers in a seasonal cycle of ice growth and melt. They also learned how those processes are influenced by atmospheric wind, temperature, solar radiation, salinity, and more. I am a scientist with the Climate, Ocean, and Sea Ice Modeling group (COSIM) at the Los Alamos National Lab. In my day to day work, I try to understand sea ice, how it forms in the ocean, moves and deforms with the currents and winds, piles up along the coastline, or is forced below the sea with the weight of a heavy snowfall. Lately I’ve been working on “things” in the ice: black dust from forest fires that are carried thousands of miles to eventually fall with the snow on the ice bed; microscopic ocean algae that freeze when the ice first forms and then, miraculously thrive in this protected though extreme environment; and, of course, salt which affects everything. My goal is to better understand the role of sea ice in the Earth’s climate system. I’m not a climate expert. But there was a moment not too long ago that I first realized, yes, I am a legitimate sea ice scientist. I grew up in Saskatchewan, Canada. We’re known for our wheat and our hockey players. The area was once a great sea bed which accounts for the fertile soils and remarkably flat countryside. It also accounts for the winds, the seemingly constant winds that pass unimpeded through the prairies and whatever windbreaker you happen to be wearing. Did I mention the 40 below winters? My upbringing didn’t engender a deep love of snow and ice but perhaps a wary respect. I always knew that I would go to college, and I have my parents, particularly my dad, to thank for that. My father was a professor of philosophy at our local university, and growing up, that university was like our playground, familiar and safe. He worked into his contract free tuition for all five of his children and was trying to swing it for at least one of his grandchildren. After high school, I remember the certainty that registering for classes was the clear next step, but only a vague notion of what I wanted to study and an even vaguer notion of where this might lead. I spent my first year as biology major, then switched to chemistry, and then, finally, to physics. Basically, I preferred math to memorization. Each change seemed profound to me at the time, but I can honestly say that today, in my present work, I use absolutely all of it. Grad school was wonderful. I fell in love with Vancouver, Canada – the ocean, the mountains, the mild winters! The chronic frostbite on my toes started to heal. Physics got harder and more esoteric. I started working towards a Masters in theoretical particle physics with applications to 2D quantum gravity. What?! Yes, I finished it, but today, I have no idea what it means. Even at the time, I had very little perception of the broader implications for the work. What was I hoping to achieve? How could I build on work that lacked a clear purpose? How could I find meaning in this work? It was at this point that I needed a formal education pause. So, off I went to a small town outside of Tokyo and spent the next two years teaching English. When I returned to grad school, it was with greater purpose and a better understanding of myself. I chose a project in physical oceanography this time, which combined fluid physics with organic chemistry and biology. It was tangible and meaningful and it opened the door to climate science and my work today. There have been many more detours since then – life events, new interests, and opportunities. All of them have conspired to make me a sea ice scientist. Last year, I was invited to the northernmost tip of Alaska in early spring before the sea ice thaw. I wore three layers under my parka, two ski worthy pairs of snow pants plus long johns and my field experienced companion still gave me an extra parka to wear on top. I was grateful. We took a snow mobile out to the ice pack where I drilled my first ever ice core. Yes, I thought to myself, I have arrived. The hands-on activity made this climate café one to remember! First, she asked the teens to split into pairs and gave each pair three clear cups. One was full of ice and the other two were empty. She had each team label one cup X and the other Y for which she had corresponding solutions. This got the teens up and moving to label the cups, obtain the solutions, grab the ice, etc. and added a wonderful element of energy to her café. 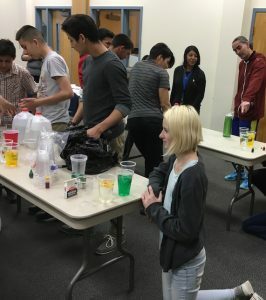 The teens were instructed to add a handful of ice to each cup and then quickly add two or three drops of food coloring. She then asked the students to describe what was happening and posed a series of questions to them about salinity, etc. and why the salt water/ice/food color combo acted differently than with fresh water. 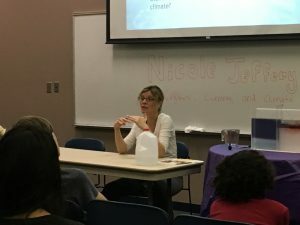 For the second activity, Nicole had two large transparent tubs where she had a pair of teens pour water at the same rate into each side. Then she had two other teens add ice (approximately the same amount at the same rate) and still two more volunteers add food color. She incorporated many attendees, which made others want to join in as well; the enthusiasm was contagious. She asked about temperature factors and talked about how one side was much warmer than the other. This was very visually appealing as the colored water trickled, swirled, and eventually mixed. The teens seemed to love both activities, even though some had performed or observed something similar in the past.